We want to create an application where people get rewarded for their creativity. We also want to engage a wide audience to attract new users to the blockchain to interact in ways that go beyond pure price speculation. We created a way to gamify creativity and participation, to get users interacting with new crypto economic mechanisms so we can finally see how they play out in real time with real users. Enter Crypto Against Humanity. 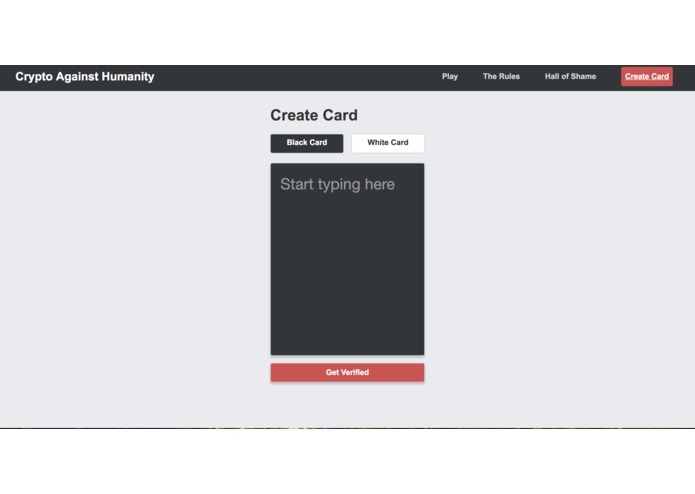 A live game of Cards Against Humanity adapted to the blockchain. Cards Against Humanity is a popular game known to be risqué and/or politically incorrect. It is played with two types of cards: black cards and white cards. Black Cards are a fill in the blank or a question. Players pick White Cards (nouns or phrases) to correspond to an associated Black Card. The Card deemed the best or funniest match wins the round. In our perpetual, ongoing game, Black Cards are chosen at random, one at a time, to be the subject of a round lasting 12 hours. Users select the best White Card) matches by buying tokens associated to the White Card. White Cards each have their own unique token which is minted on a bonding curve. This is a great way to curate White Cards which may live forever but tend to fluctuate in and out of fashion as they become overly used or cliche, die out, then rebound, or perhaps they correspond to current events. As the Black Cards rotate, we hope to see vast fluctuations in the “investment” in White Cards as they correspond to the relevant Black Card at play. Cards are created and curated completely by users. Black Cards are curated on a Token Curated Registry by incentivized token holders for Not Safe for Conference Coin Token. Anyone can submit a Black Card to the Registry. White cards can be created using a Factory Contract. When created, they have an associated Bonding Curve contract. Creators of White Cards have the opportunity to pre-mint tokens for themselves so they have the opportunity to take value for themselves if the community finds their content valuable and also buys in. Simplifying the design definitely took some long, hard thought. By far the most difficult part of the planning process. Also, figuring out what our exact metrics should be, as far as, how many of our TCR token to mint and distribute (we minted 8008135 tokens), how steep should our bonding curves be, how long is the optimal round. Ideally we’d tweak these things in the future, ideally in a decentralized way, in order to optimize gameplay. We need to get a UI working for our TCR. Currently the only way to interact with the TCR to challenge submissions is through backend tools. We also need to distribute our Not Safe For Conference Coin Token, so that many people can participate in curating the "Crypto Against Humanity Registry". There's also a lot of tidying up to do in terms of the parameters of the token economic models running our dapp. THEN MAINNET! !